Here we go with the second part of the Han and Leia Picspam: Episode V The Empire Strikes Back it's my favorite of the saga because it has everything I want in a movie and even more. I added some deleted/cut scenes to the picspam and also some passages form the book. But enough with all the talking. Enjoy the picspam! 001. You want me to stay because of the way you feel about me. 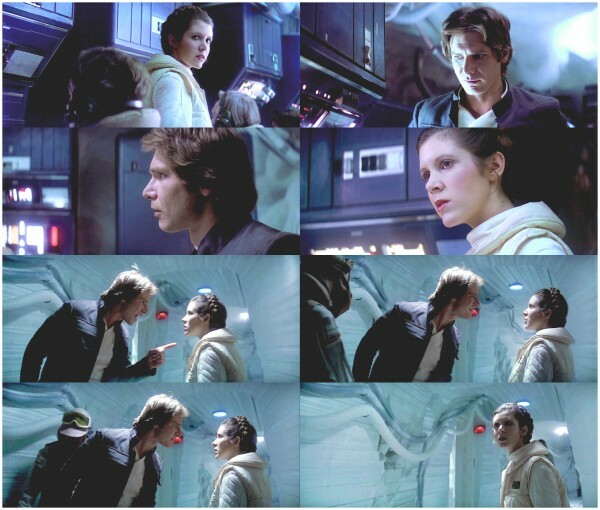 In this scene Leia is so mad at Han that I think something must went on before he left for the mission. Or maybe she just wants to look at him but she doesn't want anyone else to see the way she looks at him. Kidding... I don't think Leia is fully aware of her feelings for Han here. I think she is fighting the attraction and he can sense it. I love Harrison Ford's puppy eyes here. Han: Well, Your Highness, guess this is it. Han: Don't get all mushy on me. So long, Princess. Leia: I thought you had decided to stay. Han: The bounty hunter we ran into in Ord Mantell changed my mind. Leia: Han, we need you. Han: What about you need? Leia: I need? I don't know what you're talking about. Leia: What precisely am I supposed to know? Han: Come on. You want me to stay because of the way you feel about me. Leia: Yes. You're a great help to us. You're a natural leader. Han: No. That's not it. Come on. Come on. Han: Am I? Then why are you following me? Afraid I'd leave without giving you a goodbye kiss? 001b. I'm not really interested anymore. This scene was cut short and it has Leia walking away after Han has been quite rude. I have mixed feelings about this scene. I like the bickering and I like how desperate he gets but it's a little bit too childish and the tone is set a little bit too high. In his frustration Han admits he's interested, or he was... Leia didn't have the time to formulate an appropriate answer to that. Han: You've been so busy being a Princess you haven't learned how to be a woman. I could have helped you. But, it's too late. Your big opportunity is flying outta here sweetheart, right now. Han: Spare me please. Don't tell me about the rebellion again. Don't you think about anything else? I'm sorry but you're as cold as this planet. Leia: ...and you think you're the one to apply some heat? Han: I could, but I'm not really interested anymore. We'll meet again, and maybe by then you'll have warmed up a little. Leia: You have all the breeding of a Bantha and just about as much charm...enjoy your trip hotshot. "General, I…" Han hesitated. "I think it's time for me to move on." Han's attention was drawn from General Rieekan to a steadily approaching figure. Her walk was both graceful and determined, and somehow the young woman's feminine features seemed incongruous with her white combat uniform. Even at this distance, Han could tell Princess Leia was upset. "You're good in a fight," the general remarked to Han, adding, "I hate to lose you." "Thank you, General. But there's a price on my head. If I don't pay off Jabba the Hut, I'm a walking dead man." "A death mark is not an easy thing to live with—" the officer began as Han turned to Princess Leia. Solo was not a sentimental sort, but he was aware that he was very emotional now. "I guess this is it, Your Highness." He paused, not knowing what response to expect from the princess. "That's right," Leia replied coldly. Her sudden aloofness was quickly evolving into genuine anger. Han shook his head. Long ago he had told himself that females—mammalian, reptilian, or some biological class yet to be discovered—were beyond his meager powers of comprehension. Better leave them to mystery, he'd often advised himself. But for a while, at least, Han had begun to believe that there was at least one female in all the cosmos that he was beginning to understand. And yet, he had been wrong before. "Well," Han said, "don't go all mushy on me. So long, Princess." Abruptly turning his back to her, Han strode into the quiet corridor that connected with the command center. His destination was the hangar deck, where a giant Wookiee and a smuggler's freighter—two realities he did understand—were waiting for him. He was not about to stop walking. "Han!" Leia was rushing after him, slightly out of breath. Coolly, he stopped and turned toward her. "Yes, Your Highness?" "I thought you had decided to stay." There seemed to be real concern in Leia's voice, but Han could not be certain. "That bounty hunter we ran into on Ord Mantell changed my mind." "Does Luke know?" she asked. "He'll know when he gets back," Han replied gruffly. Princess Leia's eyes narrowed, her gaze judging him with a look he knew well. For a moment Han felt like one of the icicles on the surface of the planet. "Don't give me that look," he said sternly. "Every day more bounty hunters are searching for me. I'm going to pay off Jabba before he sends any more of his remotes, Gank killers, and who know what else. I've got to get this price off my head while I still have a head." Leia was obviously affected by his words, and Han could see that she was concerned for him as well as, perhaps, feeling something more. "But we still need you," she said. "What about you?" Han was careful to emphasize the last word, but really wasn't certain why. Maybe it was something he had for some time wanted to say but had lacked the courage—no, he amended, the stupidity—to expose his feelings. At the moment there seemed to be little to lose, and he was ready for whatever she might say. "Me?" she said bluntly. "I don't know what you mean." Incredulous, Han Solo shook his head. "No, you probably don't." "And what precisely am I supposed to know?" Anger was growing in her voice again, probably because, Han thought, she was finally beginning to understand. He smiled. "You want me to stay because of the way you feel about me." Again the princess mellowed. "Well, yes, you've been a great help," she said, pausing before going on, "…to us. You're a natural leader—"
But Han refused to let her finish, cutting her off in midsentence. "No, your worship. That's not it." Suddenly Leia was staring directly into Han's face with eyes that were, at last, fully understanding. She started to laugh. "You're imagining things." "Am I? I think you were afraid I was going to leave you without even a …" Han's eyes focused on her lips, "…kiss." She began to laugh harder now. "I'd just as soon kiss a Wookiee." "I can arrange that." He moved closer to her, and she looked radiant even in the cold light of the ice chamber. "Believe me, you could use a good kiss. You've been so busy giving orders, you've forgotten how to be a woman. If you'd have let go for a moment, I could have helped you. But it's too late now, sweetheart. Your big opportunity is flying out of here." "I think I can survive," she said, obviously irked. "You don't even care if the—"
He knew what she was going to say and didn't let her finish. "Spare me, please!" he interrupted. "Don't tell me about the Rebellion again. It's all you think about. You're as cold as this planet." "And you think you're the one to apply some heat?" "Sure, if I were interested. But I don't think it'd be much fun." With that, Han stepped back and looked at her again, appraising her coolly. "We'll meet again," he said. "Maybe by then you'll have warmed up a little." Her expression had changed again. Han had seen killers with kinder eyes. "You have all the breeding of a Bantha," she snarled, "but not as much class. Enjoy your trip, hot shot!" Princess Leia quickly turned away from Han and hurried down the corridor. I totally forgive this kiss, especially because they cut the scene short, in the longer version Leia and Luke have some time before Han arrives and they almost kiss. She's totally trying to make him jealous while proving a point and I love how Luke gets after it... Poor guy... Can't he see the writings on the wall? Han: Well, Your Worship ... looks like you managed to keep me around for a little while longer. Leia: I had nothing to do with it. General Rieekan thinks it's dangerous for any ships to leave until we've activated the energy field. Han: Laugh it up, fuzzball ... but you didn't see us alone in the south passage. She expressed her true feelings for me. Leia: My -- Why, you stuck-up, half-witted ... scruffy-looking nerf herder! 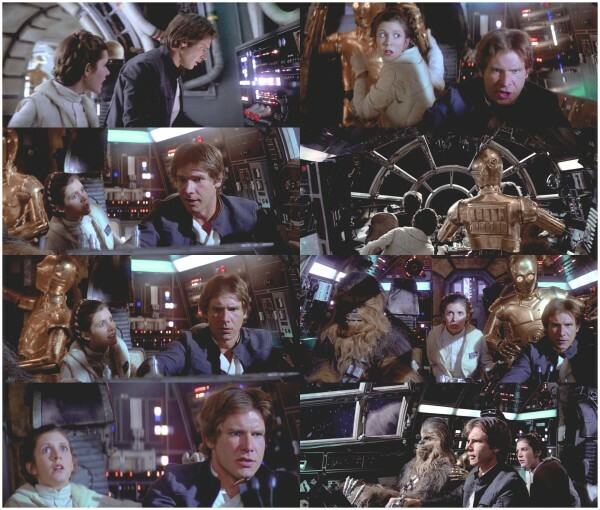 Han: Who's scruffy-lookin'? I must have hit close to the mark to get her riled up like that, huh, kid? Leia: I guess you don't know everything about women yet. “I don’t know where you get your delusions, laser brains,” she retorted. Chewbacca, amused by this verbal battle between two of the strongest human wills he had ever encountered, let out a roaring Wookiee laugh. Until now, Luke had scarcely listened to this lively exchange. Han and the princess had argued frequently enough in the past. But that reference to the south passage sparked his curiosity, and he looked at Leia for an explanation. “Why, you low-down, stuck-up, half-witted, scruffy-looking nerf-herder…” she sputtered in fury. Leia looked over at Luke with a strange mixture of emotions showing on her flushed face. Something vulnerable, almost childlike, was reflected in her eyes for a moment. And then the tough mask fell again. Oh Han... Running back to get her because you know she would still be there trying to help and maybe even go down with the base. I love how when she meets his eyes she decides it's time to go. Han: Heard the command centre had been hit. Leia: You've got your clearance to leave. Han: Don't worry. I'll leave. First I'm gonna get you to your ship. Han: Transport, this is Solo. Take off. I can't get to you. I'll get her out on the Falcon. Come on. 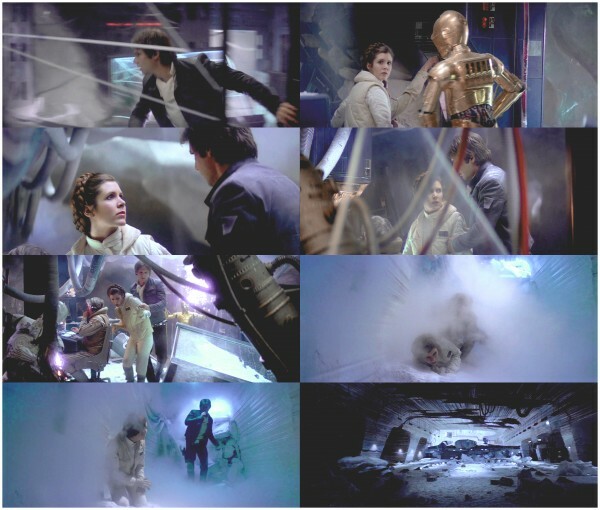 Han Solo rushed into the command center, dodging great sections of the ice ceiling that came plunging down at him. One great chunk was followed by an avalanche of ice that poured onto the floor near the entrance to the chamber. Undaunted, Han hurried to the control board where Leia stood beside See-Threepio. The princess nodded. She was surprised to see him there where the danger was severest. Leia looked exhausted. She had been standing at the console viewscreens for hours and had participated in dispatching Rebel personnel to their posts. Taking her hand, Han led her from the chamber, with the protocol droid clacking after them. 004. You don't have to do this to impress me. 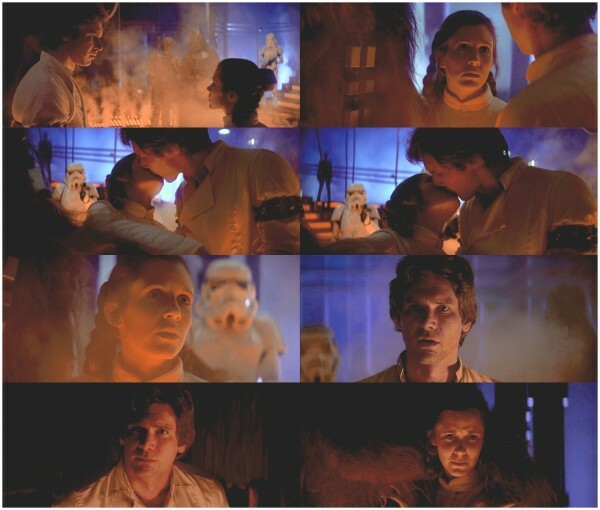 All that trying to make her confess her feelings made Leia realize that Han has feelings for her. That's great! Leia: Someday you'll be wrong. I hope I'm there to see it. Leia: I made a mistake. This could be it. I take it back. Leia gasped. She knew what Han’s order meant and was stunned by so reckless a plan. “You’re not thinking of heading into the asteroid field?” she asked, hoping she had misunderstood his command. “Don’t worry, they won’t follow us through this!” he shouted with glee. No one seemed to hear him. Princess Leia scowled. “You don’t have to do this to impress me,” she said, as the Falcon was pummeled hard by another asteroid. 005.I haven't got time for anything else. Han: Sorry, sweetheart. I haven't got time for anything else. The ship rocked once more, even more violently than before. The Wookiee howled again; Threepio stumbled backward, and Leia was hurled across the cabin directly into the waiting arms of Captain Solo. Han saw the old familiar expression of arrogance beginning to return to her face. “You don’t look angry,” he lied. “Beautiful,” he answered truthfully, with an emotion that surprised him. Leia felt suddenly, unexpectedly shy. Her cheeks flushed pink and, when she realized she was blushing, she averted her eyes. But she still did not really try to get free. Han somehow couldn’t let the tender moment last. “And excited,” he had to add. “Well, I hope you don’t expect more,” he grunted, angrier at himself than at her stinging words. Han frowned. “Fine with me,” he said coldly, not looking at her. 006. You like me because I'm a scoundrel. Finally the kiss. I love this scene on so many levels. Call me romantic but I love first kisses. This kiss soesn't fall in the romantic category because of the loacation and all the tension, but still it's one of my favourite kisses ever. Leia: Would you please stop calling me that? Leia: You make it so difficult sometimes. Han: I do. I really do. You could be a little nicer though. Admit it. Sometimes you think I'm all right. Leia: Occasionally, maybe ... when you aren't acting like a scoundrel. Han: Scoundrel? I like the sound of that. Leia: Stop that. My hands are dirty. Han: My hands are dirty too. What are you afraid of? Han: That's why you're trembling? Leia: No, you're not. You're... Okay Hot Shot. He noticed that Leia had finished her welding but was having trouble reengaging the valve, struggling with a lever that simply would not budge. He moved toward her and began offering to help, but she coldly turned her back to him and continued her battle with the valve. Han was surprised at the princess’s simple tone. He had expected a stinging retort or, at best, a cold silence. But her words were missing the mocking tone that he was accustomed to hearing. Was she finally bringing their relentless battle of wills to an end? “Sure,” he said gently. “You make things difficult sometimes,” Leia said as she shyly glanced at him. Without another word, he reached for Leia’s hand and began to massage it. Han continued to hold her hand. “Stop what?” he asked softly. “That’s why you’re trembling?” he asked. He could see that she was affected by his closeness and by his touch, and her expression softened. Whereupon he reached out and took her other hand. “I think you like me because I’m a scoundrel,” he said. “I think you haven’t had enough scoundrels in your life.” As he spoke he slowly drew her near. Leia didn’t resist his gentle pull. Now, as she looked at him, she thought he had never seemed more handsome, but she was still the princess. “I happen to like nice men,” she chided in a whisper. “And I’m not nice?” Han asked, teasing. Chewbacca stuck his head out from the overhead compartment and watched the proceedings unnoticed. Before she could finish, Han Solo drew her to him and felt her body tremble as he pressed his lips to hers. It seemed forever, it seemed an eternity to share between them, as he gently bent her body back. This time she didn’t resist at all. When they parted, Leia needed a moment to catch her breath. She tried to regain her composure and work up a measure of indignation, but she found it difficult to talk. But then she stopped, and suddenly found herself kissing him, pulling him even closer than before. When their lips finally parted, Han held Leia in his arms as they looked at each other. For a long moment there was a peaceful kind of emotion between them. Then Leia began to draw away, her thoughts and feelings a turmoil. She averted her eyes and began to disengage herself from Han’s embrace. In the next second she turned and rushed from the cabin. 007. You do have your moments. I wish someone could tell me what happened after that kiss. Han was right... she definitely needed a good kiss. Leia: You do have your moments. Not many of them, but you do have them. “I see it, Chewie, I see it,” he said. “Prepare for manual release.” Then, turning to the princess, Han said, “Here goes nothing, sweetheart.” He leaned back in his chair and smiled invitingly at her. Han was getting used to the princess’s left-handed compliments, and he couldn’t say that he really minded them. More and more he was enjoying the fact that she shared his own sarcastic sense of humor. And he was fairly sure that she was enjoying it, too. 008. All right, all right. I like how Han gets jealous so easily when Lando uses his charms especially if we compare these scenes with one of the last scenes in "Return of the Jedi". Lando: What have we here? Welcome. I'm Lando Calrissian. I'm the administrator of this facility. And who might you be? The princess remained coolly polite. “You may call me Leia,” she replied. Lando bowed formally and gently kissed the “princess’s hand. But before Threepio could finish his little speech, Han draped one arm about Lando’s shoulder and steered him away from the princess. “She’s traveling with me, Lando,” he advised his old friend, “and I don’t intend to gamble her away. So you might as well forget she exists. 009. Then you're as good as gone, aren't you? Puppy eyes alert. I love the kiss on the forehead. 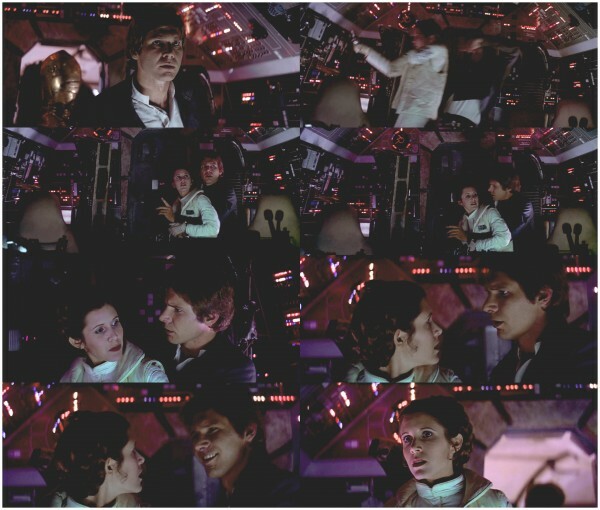 It's so intimate... and the fact Leia points out that, after they'll leave Cloud City, he will be gone. You can see from his eyes he feels guilty because he knows he has to go otherwise he's dead. He can't stay on the run forever. He's actually putting the whole resistance in jeopardy because there are other criminals/bounty hunters looking for him. And now that he finally made her realize she has feelings for him it's more difficult to go away... especially knowing there is a huge chance he'll never be back. Probably after that kiss he realized it wasn't just a silly game and he didn't just wanted her to say he liked him. He's falling and pretty hard... And she is too. Leia: Something's wrong here. No one has seen or knows anything about 3PO. He's been gone too long to have gotten lost. Han: Well, I don't trust him either, but he is my friend. Besides, we'll soon be gone. Leia: Then you're as good as gone, aren't you? I would have love to see another kiss between Han and Leia but the more I re-watch this version the more I like the original one. Han: You look beautiful...you should wear girl's clothes all the time. Sit down, come on, talk to me. Han: I'm sure he's fine. He's probably sitting around wondering what we're up to right now. A door behind him opened, and he turned to see Princess Leia standing in the entranceway to her apartment. She was stunning. Dressed in red with a cloud-white cloak flowing to the floor, Leia looked more beautiful than Han had ever seen her. Her long, dark hair was tied with ribbons and it softly framed her oval face. And she was looking at him, smiling at his astounded expression. “What are you staring at?” she asked, beginning to blush. “You look silly,” she said, laughing. Leia looked away in embarrassment. “Has Threepio turned up yet?” she asked, trying to change the subject. I remember seeing online a drawing with a Teenager Leia talking to her daddy (Darth Vader) about Han answering "I know" to her love confession and breaking into tears wondering what it meant while Darth Vader was trying to deal with her. So funny. Some people complains about the fact Han asks Chewie to take care of the princess saying "she can take care of herself you cave man" but I think it's his way to save them both some extra trouble. He needs to find a way to calm his furry friend and that's the perfect one. I ADORE the act he never takes his eyes off Leia. Like he wants to remember every detail of her face before disappearing. 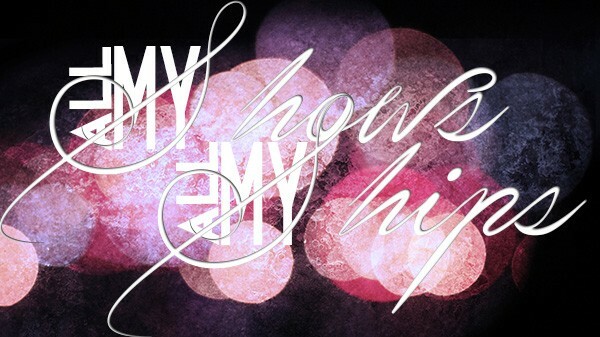 I think this says I love you more than anything else. The "I know" it's the perfect answer because he needs to give her (and himself) courage. If he said something like "I love you too" it would have been just sad. 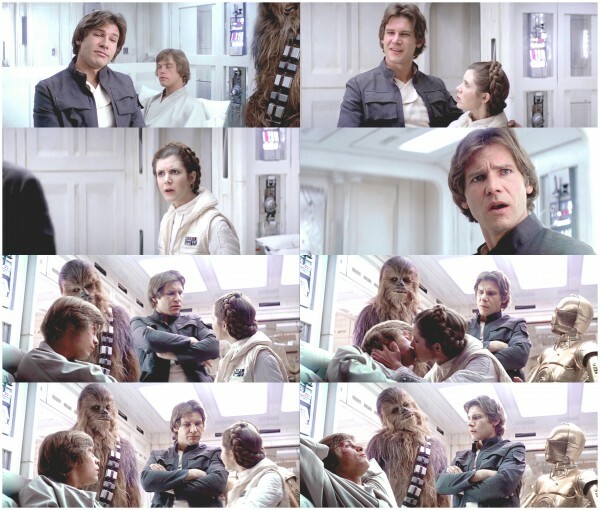 Instead he keeps looking at her and he gives her that half smile that says "don't worry, I'm going to be alright, don't be sad, you're going to be fine"
Han: Chewie, this won't help me. Hey, save your strength. There'll be another time. The princess. You have to take care of her. Do you hear me? Han gave his partner a final farewell hug, then turned to Princess Leia. He took her in his arms and they embraced as if they would never let go. He smiled his familiar cocky smile. “Just remember that, because I’ll be back.” Then his face grew tender and he kissed her gently on the forehead.